Join us out at The High Watt this Saturday night as we begin our wrap up on 2013 as we enter our final stretch of shows this month, with two highly anticipated artists who we greatly admire here at Cause A Scene. Headlining the evening is CAS vet, David Ramirez, who played a sold out show to a packed house of eager listeners and music junkies back in February of this year. Since an early age, Ramirez has himself in music. 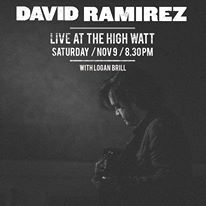 Inspired by the 90’s alt rock of his youth, later to derive artistic influence from the likes of Bob Dylan, Ryan Adam, The National and Arcade Fire, all of Ramirez’s musical influences have made their own personal mark on David as he has carefully cultivated his craft. Ramirez’s sound, an artful blend of traditional folk and contemporary indie-rock, bridges the generational gap, building himself a name and reputation that is rapidly spreading beyond his Southeast home base. An Austin native, Ramirez has spent the last several years touring across the country and writing and recording 2 full-length albums and 3 EPs, building a devout loyal fan base. In 2012 he played over 175 shows, many of which were apart of his co-headline tour with fellow CAS alum, Noah Gundersen. 2012 continued to be a good year for David as his independently released full-length album, Apologies, debuted at #2 on iTunes Singer-Songwriter charts and #23 on Billboard Folk, and received praise from The New York Times, American Songwriter and PASTE. 2013 has proved to be just as successful year for Ramirez as 2012, with the release of his most recent EP, The Rooster, this past May. He is currently capping off the back on the road, and we are thrilled he chose to his Nashville stop a CAS show. Opening for Ramirez, is a Nashville resident who embodies the image of what it means to be a strong woman in a modern world through her songs. Though she is only 22, Logan Brill demonstrates wisdom and poise in her songwriting that echos the soul of an artist far more seasoned. Her debut full-length album, Walking Wires, which released this year, is a true testament to what this young artist has planned for her listeners and herself as an artist. Brill is currently touring the north/south expanse of the east coast, her voice reaching more and more ears as she goes. This Saturday is going to be a night full of the city’s best talent that you will not want to miss. The High Watt on Cannery Row is sure to fill up quickly to see these 2 spectacular talents, so secure your spot ahead of time and get your tickets here. Doors will open at 8:00 PM and the show will start at 9:00 PM.